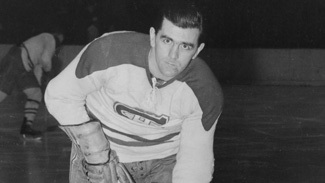 On Oct. 19, 1957, Maurice Richard became the first player in NHL history to score 500 goals. The Rocket set the standard for excellence in finishing. Since breaking the 500-goal barrier, 41 other NHL greats have followed in his footsteps. To commemorate Richard's seminal achievement from 55 years ago, NHL.com talked with several legends who followed him about being part of one of the sport's most exclusive clubs. Bobby Hull was playing in his fifth NHL game when Maurice "Rocket" Richard scored his 500th goal. Though he might not have envisioned it at the time, Hull would eventually join Richard and Gordie Howe as the third player ever to score 500 goals. On Oct. 19, 1957, Hull's Chicago Blackhawks paid a visit to the Montreal Forum, where Richard and the Canadiens were waiting. Five minutes into the contest and with the Habs on the power play, Jean Beliveau fed Richard for the decisive wrist shot. "I recall the goal going in but, for me to be able to recollect just how it happened, I can't do that for you," Hull told NHL.com. "I know back in those years, the first couple years, if we could keep the score under double-figures against Montreal in Montreal, we were doing a good job. I only saw [Richard] his last couple years, and would love to have seen him during his heyday, because he was like a god there. They did make him feel that way." On Oct. 19, 1957, Maurice Richard became the first player in NHL history to score 500 goals. NHL.com talked with several legends who followed him into one of the sport's most exclusive clubs. Though Hull would eventually achieve a deified status of his own, his legacy as a scorer was not always guaranteed. He scored 32 goals in his first two full seasons, and it was only after a trip to Europe with the New York Rangers in 1959 that Hull found his scoring touch. Hull said the larger European rinks forced him to utilize his teammates and find precise positioning for his shots. The next season, 1959-60, Hull won his first Art Ross Trophy with 39 goals and 42 assists. "It was about letting someone else do most of the work," Hull recalled. "Before that I was carting the biscuit the whole time, and I wasn't a great playmaker because I wanted the puck all the time. All of a sudden, now I'm playing with somebody who could skate and somebody who could move the puck, and I could count on myself getting into position to shoot the puck. And I could shoot it." He certainly could. As Hull transitioned from center to left wing -- where he is still considered the best of all time -- he became famous for a slap shot that struck fear into opposing goalies and was clocked at more than 100 mph. "I began to be able to shoot the puck in Junior B hockey," Hull said. "I got big and strong and used the slap shot to intimidate and also to score goals. I likely scored as many goals with the wrist shot as with the slap shot, but everyone saw me pull the stick back, look at my spot and then come down with it, and the puck jettisons from it." If his fearsome slap shot was one of a kind, the volume with which Hull scored his goals was also unprecedented. Hull scored a then-NHL record 54 goals in 1965-66, and he left the League in 1972 with five 50-goal seasons. At the time, the rest of the players in the history of the NHL had six between them. "I saw that the way to entertain people was to grab that biscuit and go with it," Hull said of his NHL years. "I saw early in my career that we were in the entertainment business. I knew that when I grabbed that biscuit and started up the ice with it, the people in the stands were getting out of their seats." As for his summiting the 500-goal plateau, Hull took a more measured approach than some of his peers. "I'm at a point where, before the season begins, we were playing 70-game schedules," Hull said. "If I was to be able to score every other game, that would mean 35 goals. You throw two or three hat tricks in there, a few two-goal games -- that was going to get me in that 50-goal range. That helped me to be consistent." Despite Hull's finishing prowess, he argued his son, Brett, was even better at depositing the puck. Bobby finished with 610 goals, Brett with 741, but the pair was almost identical in what Hull considers the most important stat, goals per game. Bobby scored .574 goals-per-game while Brett finished with a .584 average, both of which are in the top 10 all-time. "Brett Hull is the greatest goal-scorer in the history of the NHL," Hull said. "And I'm not saying that because he is any relation of mine or that he came from my loins. Brett could score goals in so many different ways. "Of course, it was a different game then -- he didn't have two or three guys following him around the ice as I did -- but he was so clever, so smart. He went to the spot where the puck was going to be. You never saw him until it was on his tape, and then it was gone. It was an amazing thing to watch him."